Born in Plymouth in 1806, Solomon Alexander Hart has been called ‘the first important Anglo-Jewish artist’; his father, Samuel, and older brother, Mordecai, were well­known engravers. Barred from the local Grammar School because of his Jewish origins, Hart was taught by a Unitarian minister, and, unable to afford an apprenticeship premium, learned to draw by copying ancient sculptures at the British Museum. In 1823 Hart entered the Royal Academy to study painting, supporting himself by making copies and colouring theatrical prints. His earliest painting, a portrait miniature of his father, was shown at Somerset House in 1826, the year he also began exhibiting at the Royal Academy; he exhibited his first oil painting, Instruction in 1828. In 1830 Hart showed his first Jewish subjects, The Elevation of the Law (Suffolk Street Gallery) and Polish Synagogue at the Society of British Artists – the latter was well­received and brought him many commissions. Elected an Associate Royal Academician in 1835, Hart became the first Jewish Royal Academician in 1840, Professor of Painting (1854–63), and finally, librarian in 1864. An influential figure, Hart was also curator of the Painted Hall, Greenwich, and an adviser to the British and South Kensington museums. Among his friends were J. W. M. Turner and Sir William Collins, who introduced him to his children saying: ‘This is Mr Hart, whom we have just elected Academician [...] Mr Hart is a Jew, and the Jews crucified our saviour, but he is a very good man for all that, and we shall see something more of him now’. Hart’s Conference between Manasseh ben Israel and Oliver Cromwell, bought by F. D. Mocatta, was presented to Jews’ College (now the London School of Jewish Studies). He died in London in 1881. Celebrated as a painter of historical scenes, Hart visited Italy, c.1841–42, making an elaborate series of drawings later used for works on Italian themes. 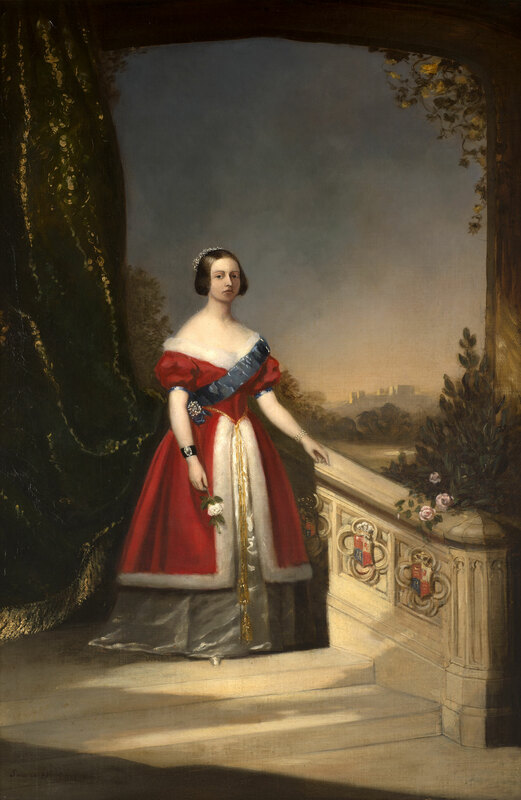 His Portrait of Queen Victoria wearing the badge of her office (the Order of the Garter) emphasises both her youth and her imperial authority and is unlikely to have been a commission. Painted five years into Victoria’s reign and two years into Hart’s Academicianship, it conveys his social and artistic integration with Britain, identifying him with the ultimate symbol of the establishment. It can also be seen as a self-portrait – the outsider as insider – signifying Hart’s achievements as a painter and perhaps satisfying his aspirations of belonging to the British establishment and the artistic elite.